Today, the Chairwoman of the FTC stepped down to allow the new administration to select their own representative. This piece provides insight in the role that the commission plays in ensuring a competitive and comsumer-friendly healthcare and tech industry. 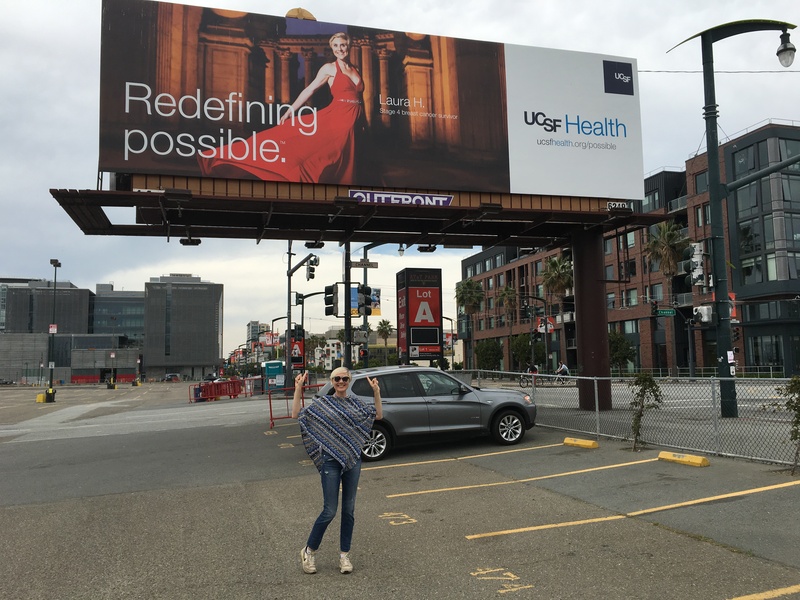 The blond woman in the flowing red dress who graces UCSF’s “Redefining Possible” billboards and ads in and around San Francisco – you’ve probably seen her, but you likely don’t know her story. 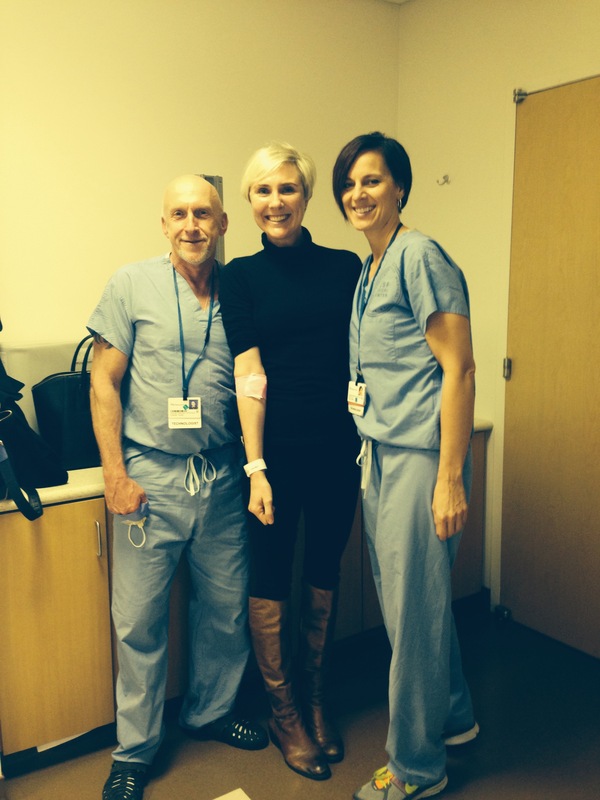 Last week, Laura Holmes Haddad visited the UCSF Imaging facility at 1725 Montgomery Street, and shared her journey from terrifying breast cancer diagnosis to three years of radiant survival. She also talked about how she wants to help others. 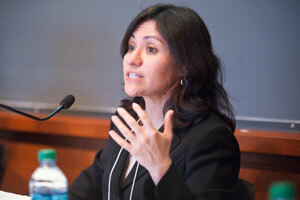 Holmes Haddad realizes that her outcome was the result of a remarkable convergence of opportunities, effort, and will. In overcoming her illness, she worked with the world’s leading medical teams, and had the active care of family and friends who supported her and championed her well-being. Holmes Haddad also credits her own self-advocacy, not to overemphasize her perseverance, but to encourage other patients. She hopes to provide tools and perspective to patients who may face a cancer diagnosis in their lifetime. To that end, she has written a book, This is Cancer: Everything You Need to Know, From the Waiting Room to the Bedroom, which will be released on October 18. What’s critical: Take time for yourself – don’t delay! Holmes Haddad was the mother of two young children, ages 14 months and 4 years old, when she was diagnosed with breast cancerand given three to five years to live. That was four years ago. As a result, she says she is more fun as a parent and kinder to everyone she encounters. She is also more aware of the everyday struggles of chronically ill patients as well as their caregivers. Holmes Haddad is deeply grateful to those who helped her and remembers the tender moments offered by her care team across UCSF. One was a UCSF Imaging tech, to whom she revealed her feelings of self-consciousness about how she looked after she lost her hair during chemotherapy. In his thick Irish accent he said, “Laura, they aren’t staring at you because your bald head makes you look funny, they are staring because they think you’re beautiful.” His profoundly kind words helped sustain her as she marched forward, not knowing her eventual positive outcome. And she had the opportunity in a private meeting to express her gratitude to Dr. Alan Ashworth, who leads the UCSF Helen Diller Family Comprehensive Cancer Center. Ashworth has spent most of his career focusing on the BRCA2 gene mutation of which Holmes Haddad is a carrier. “I shook his hand and I told him, ‘Thank you for saving my life,” she said, and there was not a dry eye in the room. When we met Holmes Haddad in person, we experienced first-hand the power she has to make others feel great. Said one of our techs, “I just want to be around her.” She exudes values we all can aspire to–kindness, humility, generosity, being in the moment. We are honored that she chose to say “yes” to an interview, and inspired by her example of saying “no” to things that do not make each day a richer one. Airbnb is the story of hard work and a company that challenges itself on a day-to-day basis by stepping back to ask tough, new questions. 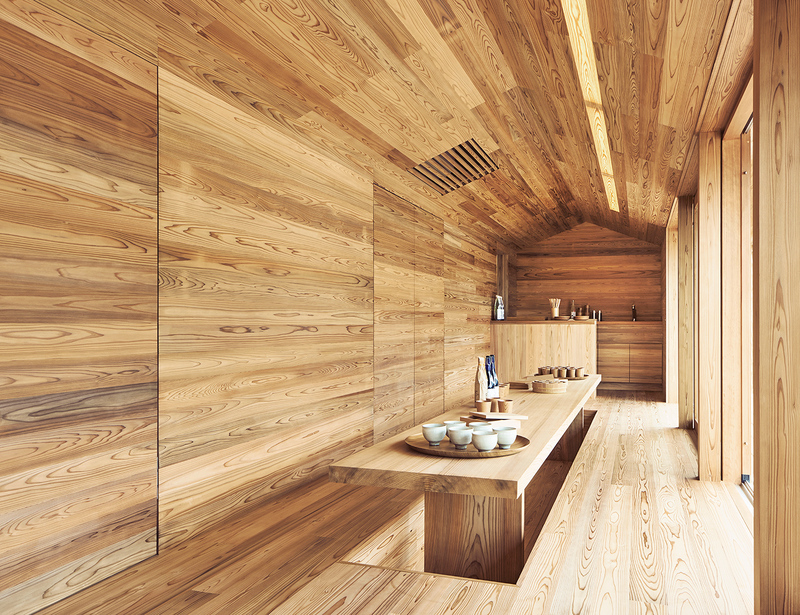 Last month, Airbnb announced the birth of new division, an innovation lab, called “Samara.” It was tasked with identifying business opportunities for the organization, one of which they have also just announced – a new hospitality concept in Japan. 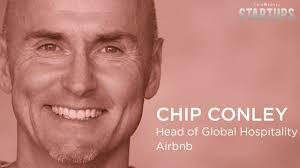 Thank you, Chip Conley, for encouraging me to follow the progress of this interesting new business by reading some of the interesting articles on the topic. Samara is hoping to tackle the issue of de-population among traditional Japanese villages by establishing cultural centers to attract international tourists. Can the model survive in Japan? If so, can it be translated to other countries? Tracking their progress will provide an interesting way to observe how innovative industry leaders, such as Airbnb, among many others, continue to adapt to shifting industry dynamics and stay competitive. I am pleased that the dinner event features presentations by UCSF scientists and physicians Miguel Hernandez Pampaloni, MD, PhD; Gil Rabinovici, MD, UCSF neurologist and chair of the IDEAS-Study; and Michael Weiner, MD. 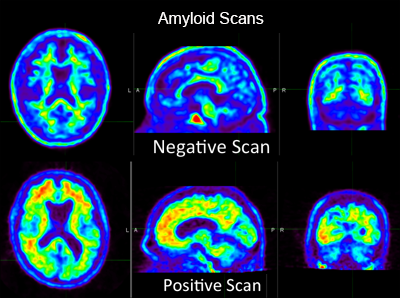 These leading authorities in the field will provide insights in advances in amyloid PET and its use in scanning for dementia. Upon completion of this activity, participants will be able to: (1) Explain the mechanism of how amyloid PET works; (2) identify the appropriate indications and limitations of amyloid PET; and (3) understand how to provide Medicare patients access to amyloid PET. Please feel free to let us know if you are able to attend or would otherwise like to remain in contact with us regarding our work in this arena. We welcome learning more about your interest. We are looking forward to hearing from you and to hopefully seeing you on Tuesday, July 19. What can kids teach us about customer service in the health care industry? Providing health care services for kids creates the perfect platform to address customer service in the health care industry. 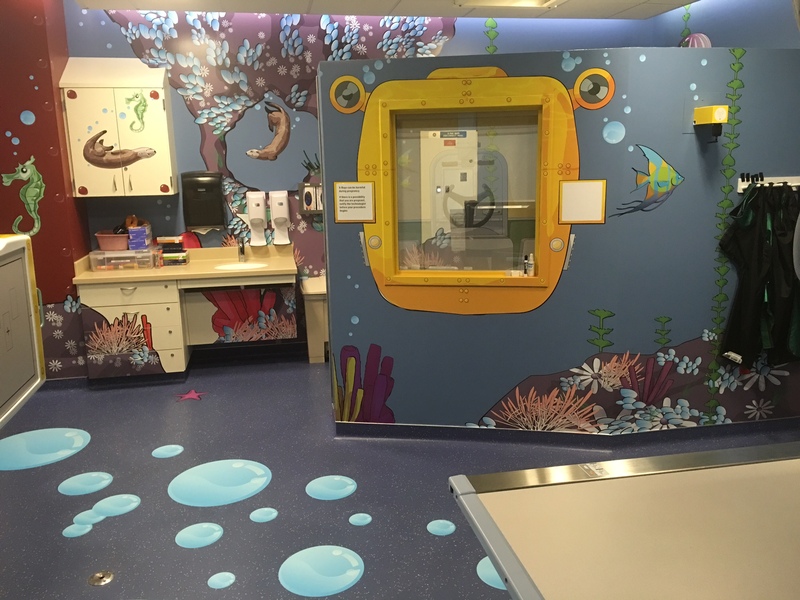 Themed imaging rooms help children navigate the health care experience at UCSF. Last week, UCSF Radiology launched its latest “adventure series,” an experience designed to make imaging more inviting for pediatric patients. Why? Many children suffer from anxiety when going through exams. The child-friendly scanners at Mission Bay make a big difference in how children react to being scanned. Children remind us that we are at our most vulnerable state when it comes to health care – we are often afraid, do not want to be there, and lack information to make us feel empowered. In terms of customer service, we may not be looking for the the definition we might first expect. In this Doug Dietz TED Talk, we hear the story of a MR scanner designer who has the opportunity, by chance, to experience a young patient’s reaction to his design – the patient is crying and holds onto her parents as she gets closer to the device. For the first time, this designer learns about the fear that customers experience with his product and uses the experience to design customer-centered scanners. Customer fear is only part of the story. The other is the realization that, traditionally, those designing healthcare technologies and services, even for kids, did not need to focus on the experience. After all, it was patient outcomes, and not patient experiences that mattered most. When we look across industries, we see organizations that systematically incorporate customer insights into processes. Focusing on customer perspectives and developing systems that emphasizes customer service is considered a more effective way to manage in many organizations. In health care, many still lead with the concepts of “outcomes” versus “experience/perceptions.” My questions is: Could these qualities be related? Where are customer insights collected? In most industries, this is not an after-the-fact collection. Instead, the starting point in the design of any new service or product is the customer perspective. One asks – What is the problem we are solving? What can be improved? Insights are collected from multiple sources. With this data, the product or service is developed and then tested extensively and evaluated from multiple perspectives. Customer needs and ratings are considered essential to the long-term success of the new launch and to the business as a whole. Organizations known for prioritizing the customer experience range from those in entertainment and retail to transportation and consumer products. We often associate concepts such as “customer delight” and “cost-competitiveness” with great customer service. Those in the healthcare industry, however, understand that customers are not expecting to be delighted, necessarily. As Doug Dietz reminds us, they are looking for concepts like reassurance, compassion and information. When it comes to price competitiveness, the sector faces structural impediments to offering clear pricing and cost-competitiveness, as we might expect in other industries. Clearly, many traditional customer service concepts, including “delight” and “cost-competitiveness” do not apply to the health care industry. Despite the fact that the some of the standard models of customer service do not apply, there is still room for the concept of shaping products and services around customer perceptions. How can we optimize patient perceptions of service while achieving optimal safety and care standards? Are these mutually exclusive? How does team communication and operational excellence impact patient outcomes? Do we monitor patient anxiety/stress as they navigate our system? Can we develop more objective measures of this issue? How is compassion evaluated and optimized across teams? Looking forward to learning more about progress being made in the health care industry. According to The Advisory Board, net promoter scores for companies like Apple and Amazon are in the 70’s and ’80’s, but, in the health care industry, scores range between 14 and 17. Talking with patient Alla and UCSF Radiologist Dr. Matt Amans about this case was one of the highlights of my year. It demonstrates what can happen when someone finds the right resource at the right time. It started with a small but persistent noise in her right ear. 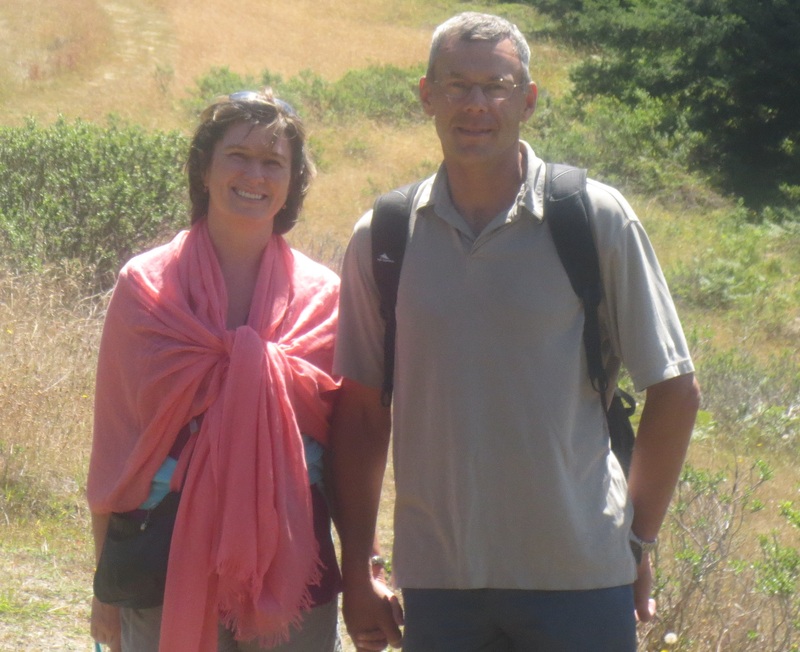 Alla and Sergei pose while hiking at the Sea Ranch in Sonoma County, California. The noise seemed in rhythm with Alla’s heartbeat. Within a month, it seemed more related to her heart than ever—the noise transformed into a clamorous “whoosh” with every beat. Far beyond annoying, the noise was disturbing, even debilitating. Activities like reading and watching TV were suddenly difficult, at times impossible. The noise often prevented her from falling asleep, and broke her sleep when it didn’t. 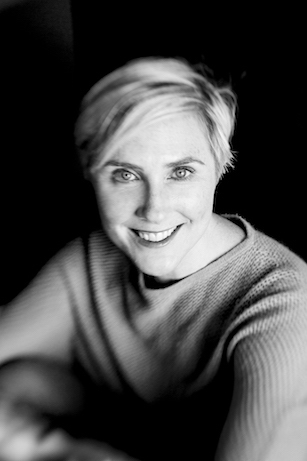 Born and raised in Moscow, Alla arrived in the Bay Area in 1992 for a career in civil engineering. She quickly made new friendships, enjoyed hobbies like traveling, skiing, and pottery, married the love of her life, Sergei, and eventually became mother to their two boys. Family life was going along quite well for Alla, until June 2015. That’s when the noise started. She began two-months of nearly nonstop diagnostic imaging and medical appointments, but no one could identify the source of the noise, much less suggest how to stop it. By July’s end, Alla was in survival mode. She and Sergei were desperate to find solutions. Finally, thanks to Alla’s primary care physician, otolaryngologist Dr. Lloyd Ford, and nerve specialist Dr. Ziv Peled, she was referred to the UCSF Pulsatile Tinnitus Clinic. The clinic is co-directed by Drs. Matthew Amans and Karl Meisel from the departments of Radiology and Neurology, respectively. Images taken during her prior medical exams allowed Dr. Amans to quickly inform Alla she had a dural arteriovenous fistula (DAVF) in her right sigmoid sinus. “No one could read the MRI the way Dr. Amans could,” explained Alla. Arteries are high-pressure vessels that carry blood from heart to tissues, while veins are vessels that take blood back from tissues to heart. They are especially sensitive to pressure changes. With DAVF, the direct connection between one or more arteries and the vein or sinuses pressurizes cerebral veins and can lead to stroke. Surgery to treat Alla’s DAVF was scheduled within a few days of diagnosis. The nine hour procedure was performed by Dr. Amans and his team, including several experienced neuro interventional radiologists, anesthesiologists, technicians, and nurses. “Dr. Amans was direct, but reassuring. He was very optimistic, which gave me a lot of strength,” added Alla. Only later did Alla learn about the complexity of the surgery, which consisted of three hours of detailed angiographic mapping of the complex network involved and six hours of embolization procedure. It went smoothly but took time, and required an enormous amount of concentration and skill operating extremely sophisticated equipment. On February 23, 2016, six months after her procedure, an angiogram performed by Dr. Amans showed that Alla’s DAVF was entirely cured, with no follow-ups necessary. She and Sergei are now able to get back to the things they loved in life, including quiet. Alla is a sanitary engineer who works in water regulation for the Division of Drinking Water. Her background in fluid dynamics helped her appreciate the combined engineering and medical excellence of the UCSF Pulsatile Tinnitus Clinic. “Nothing gets left undone,” commented my dad, Robert Skurko, when I reflected with him about the energy that gets expressed in Japanese companies during the time of the New Year. This New Year, I read Marie Kondo’s “Art of Tidying” and reflecting on the little-known secret of the New Year’s in Japan. More than anything, the season is about wrapping up and clearing the slate. It’s less about “having fun” and “celebrating” than renewal. How does clearing the slate manifest itself? From Ito Yokado to Sony, with every company I have worked in Japan, when the New Year came, we turned our office space inside out in order to clean. All old paperwork was tossed. There was dusting and cleaning. And then, last, but not least, was the creation of a slogan to help unify us in the year ahead. Then, as the New Year unfolded, we set about greeting those near and dear to us. In families, this involved extended days of eating New Year’s food. In the corporate setting, we were ready for quick cups of tea, or a personal phone call, to “greet” those whom we considered important to us. Years later, living in Singapore during the New Year and then marrying into a Chinese family, I got to experience this all over again. As one friend confided, “We have parties as an excuse to clean.” She talked about the art of clearing and cleaning, at least once in the year, which was followed by greeting friends and relatives. Again, in Singapore, after all the clearing, lucky statements (couplets and Chinese New Year decorations) were placed in the appropriate spots. Letting go of the past is not easy. In Asian cultures, they create momentum behind this act and encourage people to clean up, I believe, in order to move on. This year, as we sorted and tossed in our own home and office, after reading Kondo’s book, I reflected more deeply on the force behind this act. One image comes to mind today – seeing the beautiful Daruma, upon whose face we had inscribed our wishes with a single eye, burning at temples. 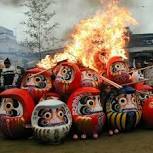 Seeing Daruma and other beautiful New Years decorations from the prior year being burned (especially b/c they were so expensive and precious!) was, at first, a shock to me. Today, it reminds me of the bitter-sweet act of letting go. “None of us – globally – has gotten health care right.” Those are dramatic words, uttered by one who should know, and, thankfully, one who is in a position to identify and support needed improvements. Darrell Kirch, MD, president and CEO of the Association of American Medical Colleges, spoke at a special session following the keynote by UCSF Department of Radiology Chair and outgoing RSNA President, Ronald Arenson, MD, at the 101st meeting of the Radiology Society of North America. 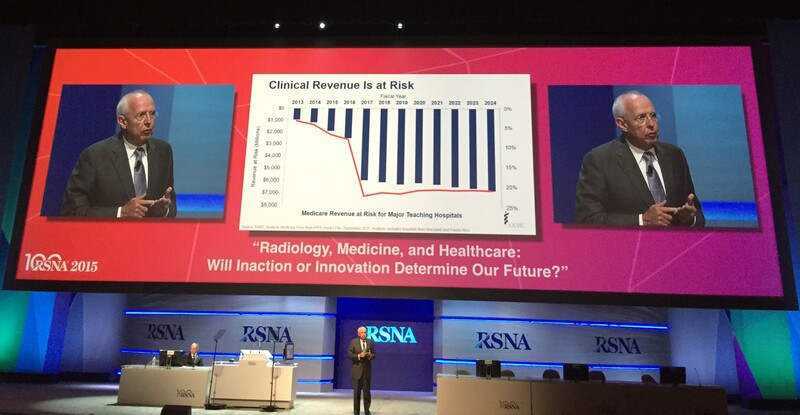 RSNA is consistently one of the country’s top three medical conferences, drawing nearly 55,000 attendees. -the global shortage of physicians, due to an aging population. He also noted that, as income from patient care and NIH funding is reduced, students are shouldering a heavier cost-burden for their education. Second, organizations need to be open to and ready to take on change. That requires they focus on their culture to develop the skills necessary to be flexible to the changing demands of the market. He pointed out that academic medical centers can take the lead and set a good example of cultural nimbleness. “Academic centers are indispensable, and as such can’t afford complacency,” he said. We often hear the call for medical organizations to remake our internal and patient-facing operations, and move from top-down management to a culture of teams, but what does that really mean in the daily work environment? What is your institution or department doing to innovate out-of-date practices and prepare for the rapidly arriving changes in health care? I am in awe of a girl who would have turned 16 this coming spring. The week of her 14th birthday, Rebecca (aka Becca) was diagnosed with osteosarcoma, a cancer of the cells that builds bones. She underwent chemo, and after ten months was on the path to recovery – or so we thought. Then, a few short months later, her mother called with news which even now I find difficult to believe. The mind and heart are at complete odds when we have to say goodbye to a young one – the mind knowing a tragedy is at hand, the heart holding on to our relationship with a girl who is growing beautifully and looking full of life. Becca was among my daughter’s first true friends. I came to know her through the magic of their friendship and thanks to her generous family, who opened wide the doors to their vulnerability and shared their journey. They have demonstrated a remarkable ability to love one another and those around them with equal exuberance, and do this with strength and grace, against all odds. Becca was joyful and energized by the world and requested that she spend her last months living a normal teenage life. She started high school as soon as she could after completing chemo, and became an active member of her school community. In return, teachers, parents and peers welcomed her with open arms. We were graced by her smiles and her appetite to live and experience every opportunity life has to offer, from a Benioff Children’s Hospital prom last spring (she wore an elegant tiara and got to have her portrait taken with the SF 49ers) to laughing about Instagram posts the last day we saw her. Until then, Becca had resisted speaking of, or seemingly even thinking about, her cancer. But at that moment, she rose above her desire to live a “normal teenage life” in order to share an intensely important message with her fellow students before she died. That message, her friend told me, was that it can be okay, even a good thing, to ask people about their cancer, to talk with them about it, ask questions if you have them. The message is a valuable one for all of us – don’t assume cancer patients do not want to talk about their illness. Ask how they feel about talking, of course. Then, if it is okay, be willing to talk, ask questions, learn from them. Along with the grief and loss that we experienced with Becca’s passing, we are left with a very clear sense of how precious life is. Of how intensely beautiful the world is in ways we had not fully perceived before. We also have a new appreciation of the medical teams that helped Becca in every way possible. I can only hope to offer what gifts I have with the same selflessness. To all who fight for the lives of others — through great medicine, service to your friends, your country, teaching someone else’s children, loving your own, or in whatever way you do, may we support you with our encouragement and gratitude. To Becca, who offered the gift of being gracious and ready to smile even in the struggle of those final months and days — our world will never be the same without you. Thank you for the gift of your friendship, and for taking a stand for what you believed in. We will help carry your torch. These were the words from James K. Theriault, who shared the story of his recent journey from Salt Lake City to San Francisco, where he underwent a crucial procedure concerning his blocked carotid and vertebral arteries, performed by the world-renowned interventional radiology department at the San Francisco VA Medical Center (SFVAMC). Theriault is a Vietnam veteran who served for three years immediately following his high school graduation. Born in Canada, Theriault became a U.S. citizen at 16 and was not required to serve in Vietnam. However, as an avid supporter of the United States, he enlisted, and enthusiastically served his tour of duty and the team with whom he trained. Teamwork was also the theme of his recent medical care at the San Francisco VA Medical Center. Theriault, a stroke victim, was referred to Daniel Cooke, MD, chief of neurointerventional radiology at SFVAMC, to evaluate his blocked carotid and vertebral arteries. He had been experiencing dizziness and falling, and his doctors in Utah were concerned he was at risk for another stroke. Because of the location of the occlusion, and the complexity of his case, he was a candidate for this procedure at the SFVAMC. 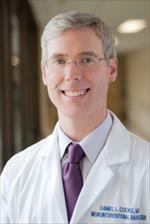 The care team included Theriault’s referring physician from Utah, Daniel Abenroth, MD, of the Department of Neurology at University of Utah’s School of Medicine; his neurointerventional radiologist, Dr. Cooke, of the UCSF Department of Radiology; and his care coordinator, Danny Langston, NP, CNS, RCP. “I received a detailed letter with my entire list of appointments, and everything was perfect,” remembered Theriault. He described how Langston, the team’s nurse practitioner care coordinator, helped him with his entire journey, from prescribing his antiplatelet medications to scheduling lab appointments, so that, within 10 minutes of his arrival at the VA, he was ready to go. Abenroth also referenced the collaborative nature of working as a virtual team, saying, “We initiallyreferred the patient to the San Francisco team due to the recommendation of our staff neurosurgeon at the Salt Lake City VA, who felt the patient would be well served by the San Francisco team.” He emphasized that the manner in which they worked with his group added enormous value to the outcome. “We received the results immediately and worked as a virtual stroke team to determine next steps.” Abenroth explained that the team consisted of a range of specialists to insure that Theriault’s health was reviewed holistically. Before the experience of transferring a patient to San Francisco VA Medical Center, Dr. Abenroth hadn’t realized that this resource was available to their patients in Utah. 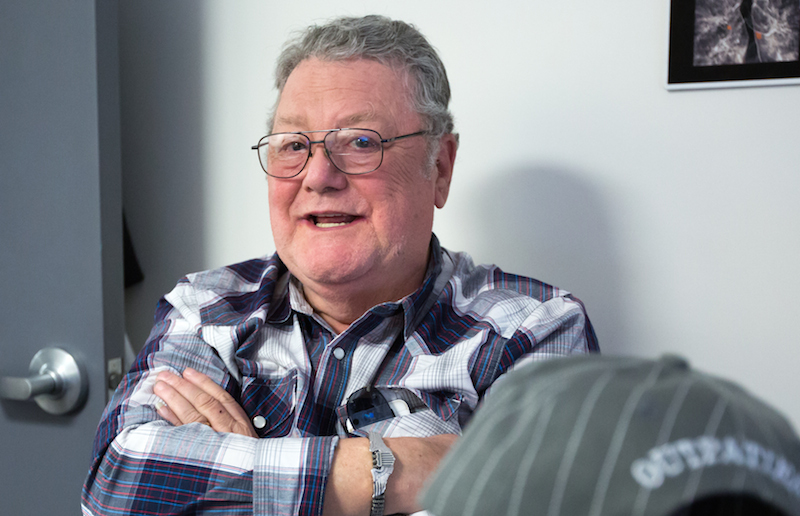 “Knowing we have access to this group is going to open the door to other patients like James.” In fact, the UCSF neurointerventional radiology team in San Francisco is a specialized referral center for the VA system and available to all VA centers nationwide. For such patients, Dr. Cooke and his colleague Steven Hetts, MD, chief of interventional neuroradiology at San Francisco General Hospital, use cutting-edge X-ray technology. As university physicians, they are able to apply the latest scientific research to their work. At the SFVAMC, the number one research program in the VA system, with over $90 million in funding, research also plays a vital role in ensuring the latest, most frontline procedures and technologies are used. In cases like Theriault’s, the team uses an interventional radiology technique called angioplasty and stenting to non-invasively treat the arterial blockages, thereby restoring blood flow to the brain. They hope that other patients who suffer from blocked vertebral arteries and are at risk for strokes might become aware of a minimally invasive alternative to neurosurgery. The field of neurointerventional radiology is relatively new, qualifying Dr. Cooke and his colleagues at UCSF as true pioneers. Dr. Cooke explained that his father was a neurologist and that he, himself, was interested in the surgical aspect of neurology. He found his passion using radiology to treat patients at the University of Washington. Today, at UCSF Radiology, a leading institution for the use of this technique, he says, “I am happy to provide patients an alternative to surgery because there is minimal scarring and rapid recovery time.” He and his team at UCSF divide their time between treating patients, training the next generation of radiologists, and researching new techniques to improve outcomes for patients going forward. To learn more about their work, please click here. Today, Theriault is full of a vigor that belies his age. Now retired after a fascinating career in the military and defense logistics, he and his wife of 10 years just completed a cruise to Alaska with friends he made in Vietnam. Theriault is also an avid scuba diver (his favorite spot is Borneo), and has recently taken up a culinary arts program. Thank you to James and his wife of Salt Lake City, Utah, for sharing your experience. We hope that your story helps other veterans understand alternatives and resources available to them when navigating complex issues surrounding their health.